The beginning of the decade saw women sewing more. Clothing was mended and patched before being replaced. Less ready-to-wear garments were purchased, even though styles were dramatically changing. A softer, more feminine style replaced the boyish, flapper look of the twenties. In 1930 hemlines dropped dramatically to the ankle. Foundations were more easily worn now that more was covered, and it helped the heavier fabrics sit more snugly and smoothly. Necklines were lowered while torsos were sensuously molded beneath squared shoulders. The new feminine silhouette meant that control foundations were back in for underwear. New softer Latex girdles were increasingly worn by younger women again. 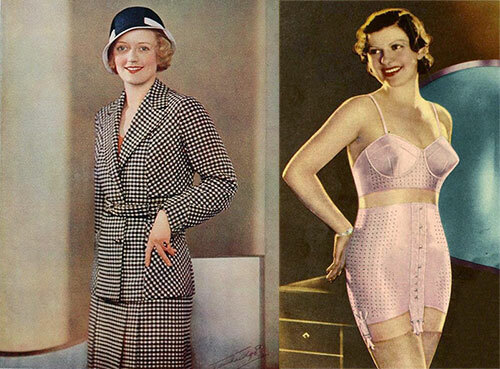 1930’s lingerie was all about control. So much for the freedom of the Flapper ! Hosiery sales however did take a dip, and if a girl of moderate means had a pair of silk stockings, they were guarded with care. Darts were replaced by soft gathers. Dress waists returned to the natural waistline. Moderately full skirts accentuated a small waist and minimized the hips. Dress bodices were designed with inset pieces and yokes. Necklines received dramatic attention, often with wide scallop-edged or ruffled collars.